You can’t walk down the street without stepping into an open-world survival game, so it takes a lot these days to make one stand out from the deluge of grindy timesinks. Towers made a striking first impression last month with a trailer unveiling a bizarre world that simultaneously called to mind pastoral Hyrule and and surreal realms of Xenoblade Chronicles and Zeno Clash. It was a whirlwind tour of weird creatures, impossible terrain and evolving cities, but what Towers is really about is gardening. It’s an open-world multiplayer survival game set on an island that’s suffered a cataclysm. It once hosted a great civilisation, but something changed, maybe it was magic, maybe it was climate change, and the island stopped being a welcoming home. There was an exodus and it was abandoned. Generations later, the descendants of this civilisation, the players, have returned to the island intent on rebuilding civilisation. But first, the island itself has to be rebuilt. Stardew Valley and Harvest Moon are just as close relations, if not closer, as Ark and Rust. Game director Khang Le’s become very interested in gardening, with his most recent fascination being aquascaping, and you’ll be needing a green thumb if you want to get ahead in Towers. Planting seeds and taking care of the world will bring it back from the brink, as well as providing future resources. But like those social farming sims, the island’s also a welcoming place. Le also talks wistfully about the moments between encountering your prey in Shadow of the Colossus, and the aimless exploration where you aren’t bogged down with countless objectives. In Towers, players will explore and experiment and figure things out for themselves, but they’ll also be able to work together. Other players are your collaborators, each helping to nurture flora and fauna, bringing the island back to life. There’s PvE, with hostile creatures and eventually even demonic invasions that can destroy the server, but players won’t be obstacles. When you join a server, you’ll need to plonk down your eponymous tower. Think of it as the heart of your base in an RTS or a MOBA. You want to protect it from attack and upgrade it with resources you’ve collected. You can’t move it, so you’ll be stuck with the spot you pick at the start of the game. Maybe you’ll pop it down on the coast so you can start fishing. First, though, you’ll need to revitalise that part of the ocean, diving in and growing habitats for fish. Only then can you exploit it, leading to Towers’ main conflict. Getting rid of a bunch of trees or overfishing can then have an effect on the rest of environment. Without those trees, maybe some of the creatures you’ve attracted will become extinct. And maybe other players need those resources that are now not available because they’ve all been harvested. There are even trade deals to think about. Say you need resources from way up in a mountain, and you’ve got a pal up there who really needs fish. So you do a deal. Eventually you can set up trade caravans, while minions scurry around gathering and delivering fish and minerals, and everyone wins. But now there’s no fish, so your buddy might stop sending you minerals, and maybe someone else in chain misses out, too. All because you were snacking too often. Since you can’t just move your base and striking out to find resources manually, even when you’ve tamed a massive beast and made it your mount, takes time out of your day, caravans will save a lot of effort. And it’s one of the ways in which civilisations are born, so it’s only fitting that it’s a pillar of this game about reigniting one. Eventually, you’ll have mines and farms and windmills, all supported by an army of workers and linked to towers all over the island by your caravans. Playing solo is still viable, though you’ll still have to share the world. It’s for people who “go to public places like Starbucks but don’t want to talk to people,” explains Le, just as much as it is for people who are always creating clubs and chatting. You can just focus on your little corner of the island and source everything yourself. And you’ll still get rewards when the server ends, even if you played mostly alone and only occasionally. Servers end in two ways: the demons become so powerful that they destroy all the towers, or players figure out the server’s secret goals and finish them before the demons overrun everything. Demonic invasions start to occur once you’ve grown your tower and escalate from there, so it might not be a terrible idea to recruit some pals. Ultimately it makes sense to help because it will give the server more time to secure a victory. They’re base defence encounters, and judging by some of the gargantuan monsters in the trailer, those defenses will need to be very sturdy. Le reckons it will take a server a couple of weeks to uncover the secret goals and start working towards them, while also making sure the demons are kept at bay. On the subject of monsters, Towers features an extremely unusual menagerie. Some are just animals, attracted by the ecosystems you’ve created, but there are intelligent beasties wandering around, too. Like the giant, grotesque eyes. These big, watery blobs once belonged to giants, but they were cursed by a shaman and all their body parts were scattered across the island, where they’ve become new species. You can gather eye boogers from them, apparently a rare resource, and you can help them find a cure for their cataracts. Poor, horrible mistakes. Some creatures can be tamed and put to work, while others are so large that they can be climbed. You can even do some gardening on them. There’s a dinosaur with a weirdly fertile back, so you can clamber up its tail, plant something and then come back in a couple of days and reap the rewards. As long as you don’t get eaten first. A safer bet might be to befriend a cranky forest god, as he’ll bring back extinct flora and fauna when he’s in a good mood. The exotic setting means even fetch quests should prove to be interesting, Le hopes. The objective might be simple, but the journey probably won’t be. Getting from A to B is slightly more complicated when you’re trying to find a plant that you have to grow on a dinosaur, or you’re scaling up a mountain and using your glider to harvest resources from sentient wings that only come to life when it’s dark. Towers’ island has static geography and landmarks, but the way ecosystems evolve will mean that it could be pretty different depending on what server you’re on. Forests and critters could exist in one where there’s nothing at all in another. And while launch is a long way off, probably at least two years, Le’s already thinking about ways he can create more unexpected changes once players get their hands on it. Despite how flashy the trailer looked, Towers is an ambitious project and still has a long way to go. Dreamlit Entertainments actually revealed it a bit early to drum up interest ahead of GDC and find a publisher. The prototype in the trailer, which is all multiplayer gameplay, was created by six core developers in a single year, which was only possible because new engines—it’s built in Unreal—have empowered smaller teams. The original concept was discussed years ago, but it’s only now that the developers have the tech and resources necessary to make something like this. The team’s had experience running a multiplayer game before, too, but things didn’t work out very well for Hawken. It got a lot of initial attention for an impressive trailer and ended up being a fun, punchy game of colliding mechs. It had the air of a simulation but was more like an action-packed arcade shooter. While Hawken had a lot of promise, it lost its first publisher, spent five years in beta and then was shut down less than a year after its 1.0 launch. Towers’ development will hopefully be less tumultuous. 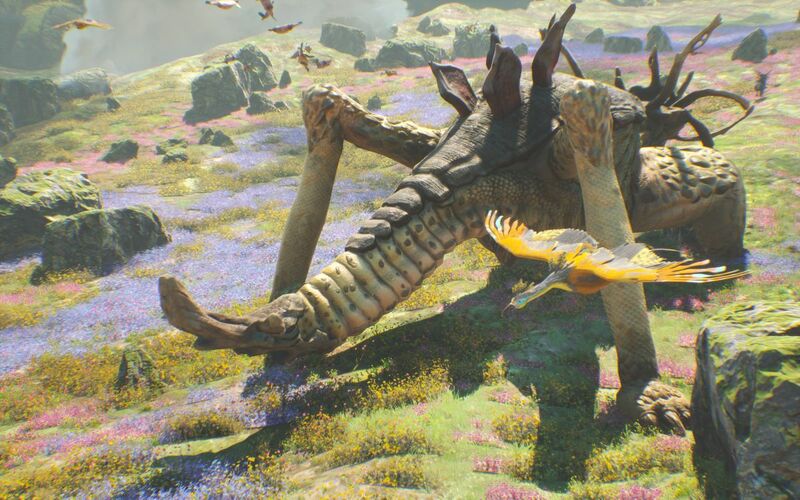 Le says around 70 percent of the game is built on “proven survival systems”, so it has a sturdy foundation to build on, and the scale will be a little bit more personal than a lot of other open worlds. Le’s thinking around 20 players to a server, with an island that can be travelled across in about 30 minutes. The goal is to create a place where there’s something catching your eye every few minutes, not some vast, infinite expanse, so he’s not against shrinking it.